Tony O. Elumelu, CON, Founder, Tony Elumelu Foundation, who also doubles as Chairman, Heirs Holdings and the United Bank for Africa, on Tuesday, 25th September, 2018, joined world leaders at the United Nations Headquarters for the launch of Youth 2030 United Nations Youth Strategy, during the 73rd session of the United Nations General Assembly. 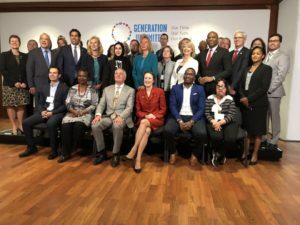 Tony Elumelu was invited to join the board of UNICEF’s Generation Unlimited Partnership, a global partnership to get every young person into quality education, training or employment by 2030. The youth initiative was launched to address the global education and training crisis currently holding back millions of young people. Tony Elumelu’s philanthropic foundation is the leading provider of funding to African entrepreneurs, having offered seed capital, mentorship and business tools to over 4,400 young Africans in the first four years of its existence, and catalysed an African entrepreneurship ecosystem that touches over 300,000 African entrepreneurs. Speaking at the launching Tony Elumelu expressed his optimism for the initiative’s robust strategy and roadmap for advancing youth empowerment globally and he called on other world leaders to drive its success. “We in Africa know that we have a critical window of opportunity to build better futures, either we capture the demographic dividend and unlock the human capital of our societies, or we face a lost generation and stagnation. The stakes could not be higher. That is why I strongly encourage my peers to play a full and active role in supporting Generation Unlimited,” he said. Tony Elumelu also announced the partnership between the Tony Elumelu Foundation (TEF) and Deutsche Gesellschaft für Internationale Zusammenarbeit (GIZ) GmbH, the German Government’s International Development Agency, to fund and train an additional 210 young African entrepreneurs from East and West Africa, using TEF’s unique African entrepreneurship platform. In four years, the TEF Entrepreneurship Programme has provided 4,470 people with seed capital worth $25million, mentorship and world-class training, a demonstration of Elumelu’s belief in the power of the African youth to drive Africa’s economic development. The Foundation will launch the youth-focused digital platform, TEF Connect, to unite and empower African entrepreneurs and serve as the gateway to the wider entrepreneurship community in Africa, at the TEF Entrepreneurship Forum later in October 2018.